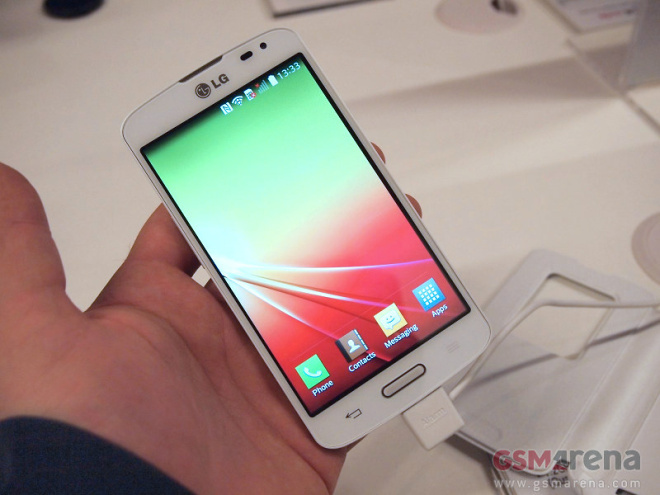 The LG F70 has a 4.5″ display of WVGA (480 x 800) resolution and runs Android 4.4.2 KitKat with LG’s customizations on top. LG is marketing it as a very affordable LTE device and has implemented a unique Knock Code, which will unlock the device after a specific knock sequence. It works like a charm after you’ve gotten used to it and is innovative and intuitive. The feature also works nicely with one hand. There’s also the LG Guest Mode and more. The display offers nice colors and acceptable viewing angles. There are a physical home button and two capacitive home and back ones so there won’t be any on-screen buttons to eat away screen estate. Ticking inside is a Snapdragon 400 with four 1.2 GHz cores. There’s also a 2440 mAh battery to puch the midranger around. The plastics feel fingerprint-prone and glossy but not cheap and the texture adds some grip to it. To complete the tally there’s a 5 MP camera on the back and a built-in microSD card slot. The LG F70 supports LG’s Quick Window flip case – the screen can be operated even when covered.